Recycling makes a tremendous difference and sets the stage for change, but it’s important to clarify exactly which items can be recycled, and which items actually interfere with the process. If you’re serious about reducing your ecological footprint, mindlessly separating your waste won’t really do the trick. You have to be aware of the materials and everyday items which can’t be recycled, so you can do your best to keep them away from the recycling bins. Here’s a list of typical items that most people fail to adequately sort out. The concern with some types of food packaging that makes it unsuitable for recycling relates to grease; that is why takeaway pizza boxes, by default, should not be recycled. Additionally, some types of food packaging are made of materials that simply cannot be recycled at the moment given the available technology – most notably crisp packets. In fact, many types of foil packaging cannot be recycled because they’re made of metalized plastic; obvious examples include pet food, baby food and all kind of soft foil packaging in general. When you start looking intently at the materials and packaging that come with your beauty products, you will start noticing just how some of these everyday objects are unsuitable for recycling. In this department, the main items to watch out for include dispenser tops used in soap pumps, mirrors, and tissue boxes featuring a plastic insert that can’t be easily removed. No kinds of nail varnish bottles are suitable for recycling, and shampoo bottles can only be recycled provided they have been thoroughly rinsed beforehand. As a general guideline, most beauty products that leave residues in the packaging cannot be effectively recycled. You may have noticed how plastic straws have recently been under attack as a leading mass pollutant, and there are good reasons why. Even though they’re made of plastic, drinking straws are too small to be effectively picked up by recycling machinery so they typically fall through and end their life cycles in a landfill. There are several other inconspicuous kitchen items that are similarly unsuitable for recycling: kitchen rolls (the cardboard tube can be recycled though), paper napkins, coffee cups, wine glasses and all kinds of glass cookware are leading examples of things that can’t actually be recycled. Likewise for all kinds of cutlery and even pots and pans, all of which you should discard by conventional means. When it comes to office supplies and everyday items that are surprisingly unfit for processing, the most notable culprits that often throw a wrench in the recycling gears include photo paper, plastic toys and all kinds of gift wrap that aren’t made of 100% paper. The problem with these kinds of packaging styles is how they rely on complex or composite materials that can’t easily be separated by hand, which means they can’t be effectively added to the appropriate recycling bin. If you’re unsure about whether a specific item is recyclable, you can easily search this information online. 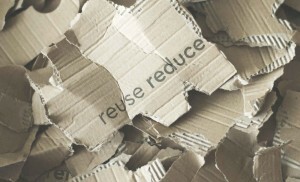 Ultimately, it invariably fitting to double check whether the item you’re about to recycle can truly be recycled, but that itself is an exceptional step to be becoming more environmentally aware. If you ever have any questions please do not hesitate to get in touch with the experts at Dial A Bin.